Pedro Eustache (Photo Credit: Andres Jimenez, copyright Gynook Production, Inc.) The wildly popular HBO series Game of Thrones has come off the screen and onto a live immersive stage concert experience featuring 807 linear feet of video displays and 3D designs that rise from the stage floor. 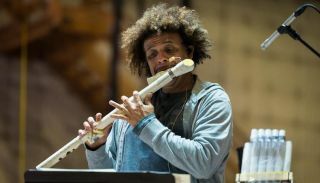 Pedro Eustache, the featured winds soloist channels GoT’s iconic Songs of Ice and Fire through 15 different instruments, including two he custom built for the tour, and a 14-foot horn. The multidirectional artist will wear Point Source Audio in performances of eight exotic flutes he plays on the tour. The invitation to join the Game of Thrones Live Concert Experience, conducted by score composer Ramin Djawadi is “an honor” said Eustache about being the featured soloist on the 24-date tour that started February 20 in cities across the United States and Canada. Eustache boasts an impressive collection of nearly 600 instruments from all over world that he either designed, built, or modified over the course of his 40-year career as a woodwind specialist. He found the sonic quality he needed with Point Source’s CR-8D cardioid headset microphone—along with a few bonus features that set the mic apart from anything Eustache has used before. “I'm telling you, literally your headset mic is like a Godsend–beautiful!” Eustache told Point Source Audio. “What sold me on the Point Source mic that is also very important is the extendable length on the boom that allows me a lot of placement choices,” Eustache added. The company’s flagship “unbreakable boom” flexibility allows Eustache to practically stair step the mic boom quickly to the right angle no matter which instrument he is playing. Another handy feature for Eustache is the collapsible earhooks on the headset mic. He cited it as one of the main reasons he switched to Point Source: “It can become incredibly compact for transportation when you move the ear pieces and you put them flat. That's amazing.” Immediately at the conclusion of the GoT Live Concert Experience tour, Eustache will join the Hans Zimmer Live Tour opening April 14. According to Eustache, the compact cardioid headset will once again be his mic of choice because with hectic schedules and high-profile concert performances, there is no room for error—or delicate headsets unable to withstand the rigors of travel.